MAGNUS (AUS) (Bay 2002-Stud 2008). 4 wins to 1200m, AJC Galaxy H., Gr.1. Sire of 264 rnrs, 181 wnrs, 11 SW, inc. Magnifisio (WATC Winterbottom S., Gr.1), Platinum Kingdom, Magnapal, Prince of Brooklyn, Miss Promiscuity, The Alfonso, The River, Malaguerra, Alpha Beat, Missy Cummings, Prettyhappyaboutit, SP Gredington, Manageress, Whistle Baby, Backstedt, Magnus Reign, Malibu Style, Lucky Symbol, Magnus Lad, Pompeius, Powercharged, Aeratus, etc. THE RIVER (g. by Magnus). 2 wins. See below. Jestpatim (g. by Patronize). 5 wins-1 at 2-to 1300m, A$180,550, to 2014-15, WATC Westspeed 3YO H., Pink's Bacteria Eliminator 2YO P., Bert Hammond H., Twitter.com Perthracing H., Congrats to Premiership Winners H., 2d WATC Perth S., L, Westspeed 3YO H., Westspeed Forms in Now H., 3d WATC Cheryle Irons H., Skyy Vodka H., Carlton Draught H., Happy 70th Birthday Harvey Crossman H.
Jest Envy Her (f. by Patronize). 3 wins-1 at 2-at 1000m, 1100m, A$137,450, to 2014-15, WATC Westspeed H., Bruce Kelley's 80th Memorial H., 2d WATC Westspeed Nominations H., Westspeed Nursery H.-3 times, Westspeed H., Westspeed Sprint H., 3d WATC Westspeed 2YO P., Westspeed Nursery H., Westspeed 3YO H.
Jester Derriere (f. by Patronize). Winner at 1200m in 2014-15, 2d WATC Westspeed 2YO P., 3d WATC Westspeed 2YO P., Westspeed H.
Hide the Loot. 10 wins to 1400m, A$446,320, WATC Machine Gun Tom H., Eastern Zone H., Euclase H., Healthy Food Fast H., Phoenix Shutdown Services H., Craft Memory H., Naidoc Celebration H., Winter Championship Final H., Italian Festival Winter Championship Heat H., Ozbet.com.au H., 2d WATC Gill's Dream H., Perthracing.com.au H., Corfield Tavern H., Winter Championship Qualifying Heat H., Support Your Local TAB H., Ozbet.com.au H., Dark Beau H., Brazzaka H., 3d WATC Norman Albert Parnham JP Memorial H., Pink Lady Luncheon Sprint H., Perth Racing Members H., Perth Legacy Sprint H., Vinnies Winter Championship Qualifying Heat H., Liquor Barons Northam H., Baileys Mint Chocolate H., Community Workplace H., San Simeon H., FC James 100th Birthday H., Perth Racing TV H., Bali Recovery Project H., Support Your Industry H., 4th WATC Belmont Sprint H., Gr.3. VIZARD (Magic of Money). 11 wins at 1000m, 1200m, A$370,525, WATC Beaufine S., L, Belmont Newmarket H., L, Perthracing.com.au H.-twice, Key Business Sprint H., Portinari H., Sovereign Shell H., Golden Heights H., Flexi Quaddie H., Welcome Back to Belmont Park H., Perth Ice Works H., 2d WATC RS Crawford H., L, National Jockey Celebration Day H., Magic Millions Perth's Group One Performer H., Tabform Out Now H., Crown Prosecutor 2YO H., 3d WATC Fishers Circle H., Look for the Tick Guaranteed Pools H., Ozbet.com.au H.
Le Perancis (Belele). 5 wins at 1100m, 1200m, A$95,490, S$1,750, WATC Enjoy Healthy Eating H., Global Explorer H., Heron Bridge H., 6996 Test Runs H., 2d WATC Bonny Note H., 96FM H., Parliament H., Jolly Beggar H., 3d WATC Belmont Guineas, L, Tuscany 3YO Quality H., Azennis H., Myer H., EGIS Consulting H.
Philby. 7 wins from 1200m to 1600m, A$208,545, WATC Icewing H., TAB Another 50 Years H., Supply Direct H., Pepsi H., Become a Racing Member H., Ozbet.com.au H., 2d WATC Irish Day at Belmont Park H., La Belle Russe H., Jungle Comedy H., Assured Ascot Quays H., 3d WATC Perth Cup Day at Ascot H., Pink's Floor Care H., Pedleyco Eofy Celebration H., 4th WATC Lee Steere S., Gr.2. Tillibelle. 2 wins at 1200m, 1250m, WATC Kaytello H., 2d WATC Ever Ready H., Petite Amour H., 3d WATC Ice Wing H., Ellicorsam H. Producer. Magic Eight. 6 wins to 1300m, A$116,930, WATC Westspeed 3YO H., Rosemount Twilight Harvest H., Become a Perth Racing Facebook Fan H., Playeronline.com.au H., 3d WATC Westspeed 3YO H., Perth Racing Members H.-twice. Tickle the Till. 3 wins. See above. Race Record: 3 Starts 2-1-0 A$224,700. 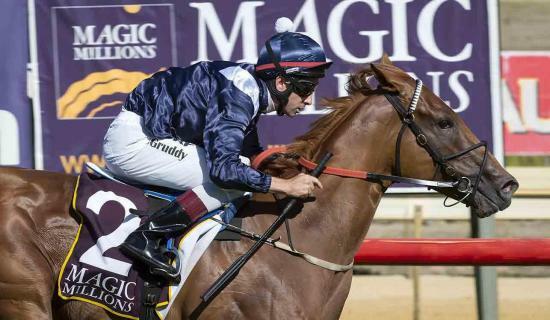 2 wins at 2, A$224,700, in 2015-16, Pinjarra RC Magic Millions Perth 2YO Classic, L, WATC Amelia Park 2YO P., 2d WATC Perth Racing Ascothappens 2YO P.